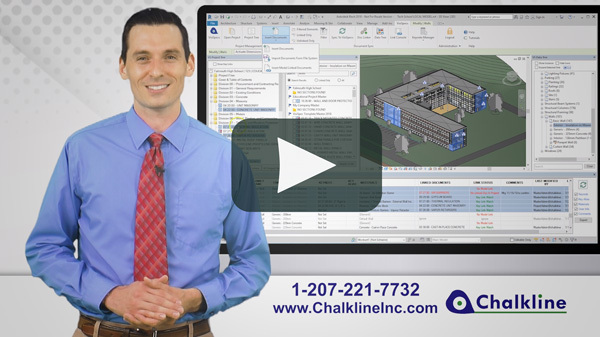 Chalkline is the developer of VisiSpecsTM, the next generation suite of applications to visually document, coordinate, and verify the BIM models and project specifications. VisiSpecs is a hybrid cloud solution where it’s desktop and mobile applications store and access the model and specification data on the Company’s cloud servers for easy access and collaboration among distributed team members. VisiSpecs is built on the familiar applications already in use resulting in minimal training and setup time. Users can easily integrate their own masters and project documents with the project models to accomplish true BIM integration without learning to use complicated model applications and without a lengthy integration process. And for those that do use the model applications, VisiSpecs provides direct, integrated access to the project specifications and documentation. Throughout the building lifecycle, VisiSpecs enables a smooth transition of your design preferences and data while improving project team collaboration and access to information which results in lower building design, construction, and operation costs. VisiSpecs enables Architects, Engineers and other designers to improve quality, differentiate their services, and reduce time and costs. Adoption is fast and easy since VisiSpecs supports the tools you already use. Link your BIM models and specs in under an hour using our Free Trial! Estimating, bidding, construction admin, updating as-builts, and commissioning require easy access to construction documents and drawings. VisiSpecs links the construction documents and drawings enabling access to critical data when and where it is needed. Creating a BIM model may look nice, but it is the specs that are used in the bidding and product selection process. Make sure your models and specs are linked and easily used throughout the design and bidding phases to increase your revenues and market share.